Where an when are how many and which type of bicyclists on the road? Which variables influence bicycle traffic? How can very different demands and mobility behaviors be adequately addressed? How can a sustainable bicycling culture be established? Questions like these build the background for a research projecet called Bicycle Observatory – On the Pulse of Cycling. They are going to be tackled by an interdisciplinary consortium together with numerous partners until September 2020. The research project is funded by the Austrian Ministry for Transport, Innovation and Technology (BMVIT) within the program “Mobility of the Future” (FFG project number 865176). 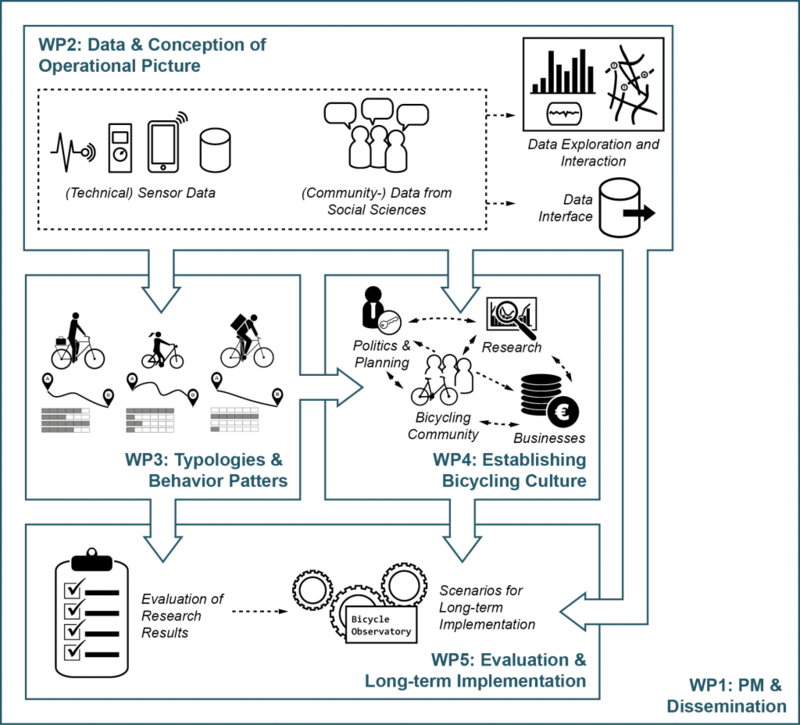 The project Bicycle Observatory aims to fuse technical sensor data and qualitative data into a multi-dimensional, spatially differentiated picture of bicycle mobility. This should facilitate a better understanding of the system of bicycle mobility and the vast variety of bicyclists. The contribution of the project Bicycle Observatory to the establishment of an extensive bicycle culture is evaluated in the domains of planning, politics, science and the bicycling community. A temporally continuous observation (in the sense of Miller’s (2017) Geographical Information Observatory), of bicycle mobility from multiple perspectives and with scientific monitoring has never been transferred to an operational level. The project Bicycle Observatory can thus be regarded as an important step towards a permanent establishment of such an observatory. For this, existing and newly developed concepts and knowledge is going to be joined. Moreover, the necessary technical and organizational framework for a stable operation is going to be investigated. Insights into the temporal, spatial and qualitative distribution and patterns of bicycle mobility in the test region of Salzburg and a significantly improved data basis for the study area. Typologies of bicyclists, each with explicitly described spatial and temporal behavior patterns and specific attitudes and requirements toward bicycle mobility. Data and evidence base for politics and decision making, which facilitate the development of innovative services and business models. Support of current economical and societal dynamics in the context of bicycle mobility that enables organizations and citizens to get actively involved. Major milestones and successes will be published in a dedicated section. If you have questions concerning the research project or want to collaborate, get in touch with us anytime. We are looking forward to your message!